Felix Shepherd is a British singer-songwriter who merges Alt-Pop and RnB melodies, that are yet to be heard. Felix Shepherd will play on Sat 15th June 2019 at The Sunflower Lounge Birmingham. Tickets are available here. After his previous run in the indie pop world, Felix’s new sound is being compared to the likes of Bazzi, Billie Eilish and Frank Ocean. The combination of his groove and melodies compliment the mix of R’n’B, soul and electronic textures. 2019 see’s him seduce a wider audience with his new sound after gaining the support from the likes of BBC Music Introducing with his debut and appearing on the X Factor. Indian Queens, hailing from Hackney Wick, make music for people of the night. For those who live in a dream like state or those who use the dark to carry out their nefarious habits. The only light in Indian Queens world comes from a flickering street lamp or the dull glow of a mobile phone. It’s the music of Dickens East End before the gentrification. Indian Queens will play on Sat 27th April 2019 at The Sunflower Lounge Birmingham. Tickets are available here. This year they were hand picked to support artists such as TT/Theresa Wayman (Warpaint), Amber Arcades, We are Scientists, Ash and Broncho. Indian Queens were also invited to play a special showcase at House of Vans which lead to them playing their own stage at this year’s Bestival. They also included their current tracks on their in-store playlists across Europe. Other Festival Appearances include Camp Bestival, Boardmasters, Meltdown, Leefest, EVOL and others. After being John Kennedy’s Hot One on XFM twice in a row, he asked the band to play his own night sponsored by the station. Other Notable plays include Tom Robinson (BBC Radio London), Shell Zenner (Amazing Radio), Goldierocks (The Selector), Burberry Emerging playlist on Apple Music. Hunter & The Bear will play on Weds 8th May 2019 at The Sunflower Lounge Birmingham. Tickets are available here. Inspired by artists such as The Band, Lynyrd Skynyrd, Bruce Springsteen, Will & Jimmy started to write and perform as a duo. Jimmy took responsibility for lead guitar, mandolin and vocal whilst beside him Will not only played rhythm guitar but also kick drum and joint lead vocals. Will took a performance course at University, where he met Josh who was also pursuing the same degree. Jimmy & Will had already decided they needed a third member to play bass and over a few drinks, and despite already being an accomplished guitarist, Josh decided to learn the bass. This completed the band lineup and in November 2012 the trio all moved to London to bring their own brand of power folk to the huddled masses. A mix of folk, country & rock, tight three part harmonies and explosive energy ensures an impressive live show. Sydney outfit PLANET is the culmination of several years of trial and error in songcraft, performance and production. They were first brought together by their shared love of music: old and new, foreign and domestic. Drawing influences from past and present the four-piece combine pop laden guitar hooks with soaring vocal melodies. The result is a sound which is reminiscent of Britpop but remains undeniably Australian. PLANET will play on Mon 13th May 2019 at The Sunflower Lounge Birmingham. Tickets are available here. In 2016 PLANET released a slew of singles, including ‘Undermine’ and ‘Can’t Conect’, which were subsequently added to high rotation on Triple J Unearthed and also received airtime on Dom Alessio’s “Home and Hosed” program. The lads pushed forward into 2017 releasing ‘Aching Dream’, the first single off their forthcoming EP, exclusively premiered via Rolling Stone Australia who describe it as “a minimal ballad … [building into] epicness suited for stadium sway-a-longs”. The song has since recieved a number of plays across Triple J and Unearthed. Overseas the band’s unique sound has drawn attention and airtime in the UK on “This Feeling” and Radio XFM. Their follow up to ‘Aching Dream’ was revealed earlier this year in the grittier single ‘Save.Sold’, earning the quartet a rotation addition on FBI and an abundance of glowing reviews, including the covered title of I OH YOU’s Fresh Juice. Following its release the band announced they would be crossing the equator to tour the UK and Europe with fellow Sydney-sider DMA’s, where they played 24 shows in just 30 days. Having signed with booking agents New World Artists in late 2016, PLANET kept themsleves busy playing a string of shows all over the country supporting British India and UK giants JAMES. They also made their debut on the Australian festival circuit securing slots at Festival of the Sun, Lost Paradise, Party in the Paddock, Blurst of Times. As proof of their ability to stand on their own merit, look no farther than their first ever interstate single tour. The boys played three shows in support of their most recent effort, ‘Aching Dream’. Starting with an intimate affair at The Foundry in Brisbane, the band headed down to Melbourne to play a rowdy post-midnight gig at Yah Yahs before bringing it all back home for a sold out show at The Chippo in Sydney. Over the course of this period the band have developed a tight and energetic live show which has on more than one occasion resulted in sweat drenched t-shirts and arm in arm sing-a-longs. Showing no signs of slowing down, the boys have pushed forward through 2018 and are touring Australia’s East Coast in support of their recently debuted EP ‘Waking Eight’ in June. Juniore are a French indie pop quartet from Paris led by singer and songwriter Anna Jean. Before forming Juniore in 2013, Anna Jean collaborated with Samy Osta in an indie folk duo called Domingo. Juniore will play on Thurs 2nd May 2019 at The Sunflower Lounge Birmingham. Tickets are available here. With Domingo, Anna Jean released one LP in 2008. In the following years, her mysterious, sultry vocals would lead her to collaborations within the Parisian electro scene, appearing as a guest vocalist for artists like Jackson & His Computerband and Bot’Ox. Working again with Osta, she formed Juniore, originally as a duo, later expanding into a quartet. Mixing modern indie pop sensibilities with elements of retro French pop, dark, twangy surf guitar, and a vocal style that falls somewhere between Cat Power and Françoise Hardy, Juniore released their debut 7″ single, ‘Christine’ b/w ‘Dans le noir’, in late 2013 on the Parisian Entreprise label. Juniore then released several singles and two albums: ‘Juniore’ in 2016 and ‘Ouh là là’ in 2017. 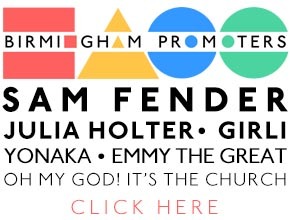 Joel Baker will play on Fri 26th April 2019 at The Sunflower Lounge Birmingham. Tickets are available here. Encapsulating a sound that falls somewhere between Ben Howard and early Jamie T, the former Labour Party speech writer, singer-songwriter, musician and producer was discovered by BBC Introducing Nottingham and key champion DJ Dean Jackson after sending his demos into the station in embossed parliamentary envelopes. Since Joel came on the scene he has racked up millions of streams, landed countless radio playlist spots with BBC Local, BBC Radio 1, 1Xtra and Beats 1 and been championed by everyone from Dean to Huw Stephens, MistaJam, Jack Saunders and DJ Target, through to i-D and Clash, to Taylor Swift who included his single ‘No One In Heaven’ in her ‘Songs Taylor Loves’ Spotify playlist. London, UK – 22nd Febuary 2019 – BBC Introducing artist Joel Baker releases new single ‘What’s A Song’ via Virgin EMI and tickets for his 2019 headline tour today. Produced by Jordan Riley ‘What’s A Song’ is the first instalment from his forthcoming debut album and firmly places a marker in the sand for what fans can expect from his longform debut. The new single follows the success of his recent Bag of Dreams mixtape which featured a guest appearance from Abra Cadabra and was co-produced by Joel alongside Courage (Ray BLK), Kin (Naughty Boy) and Maths Time Joy (Gallant); and follows EP’s Winter Dreams and The Dreamers EP, which featured stand-out collaborations with Sneakbo and BBC Sound of 2019 nominated Mahalia. Joel’s momentum is set to continue throughout 2019 with the release of his anticipated debut album and headline tour. Performing a blend of experimental-pop, soul and electronica, UK based singer, songwriter and producer SAER is forging a name through his musical collaborations and set to feature on new releases later this year. SAER will play on Sat 27th April 2019 at The Sunflower Lounge Birmingham. Tickets are available here. An emotive singer with a distinctive voice, SAER’s songwriting embraces curiosity and vulnerabilities in human nature; delivered fluently with a haunting falsetto. SAER is a multi-instrumentalist that moves effortlessly between stormy electronica soundscapes and minimalist, heartfelt laments. Influenced by the likes of Jeff Buckley, Nick Drake and Imogen Heap; with rousing piano with soaring vocals, SAER conjures a contemporary sound that is both unique and intriguing. Low Island will play on Wed 20th March 2019 at The Sunflower Lounge Birmingham. Tickets are available here. Low Island is the collaboration between DJ/Producers Jamie Jay & Carlos Posada, bassist Jacob Lively, and jazz drummer Felix Higginbottom. You’ll never find Low Island forced into wearing a creative straight jacket. In this respect, they are truly creatures of the 21st century, seeing no contradiction in slipping between uplifting electronica and intimate ballads – or merging the two. It was a step that was both deliberate and natural. Not only have they struck this happy medium, but their creative juices are in full flow right now, with a string of EPs and singles under their belt, a highly acclaimed immersive live show, and on going collaborations with the Fashion, Dance and Theatre worlds. Low Island belong to the now. The Men That Will Not Be Blamed For Nothing hail from London, UK. The Men Who Will Not Be Blamed For Nothing will play on Sat 13th April 2019 at The Sunflower Lounge Birmingham. Tickets are available here. They sing loud punk rock songs about the Victorian era, and have been gleefully rubbing the face of present day Britain in the rotten corpse of its past since 2008, in the hope that it will learn from its mistakes (it hasn’t).